Thanks to their waterproof uppers, subzero insulation and fluffy high-pile linings, the kids' Bogs Arcata Stripe rain boots handle snow drifts, mud puddles and frigid winter air with ease. The Bogs Bluefish Sandals keep summer simple and focus on the play at hand with easy slip-on style and airy comfort. Bogs were first created for farmers in soggy Oregon, and the kids' Classic Axel rain boots have the rugged design to prove it. Waterproof with Neo-Tech insulation, they keep kids warm and comfortable. The durable Bogs Classic High insulated rain boots will keep kids' feet warm and dry in wet conditions. 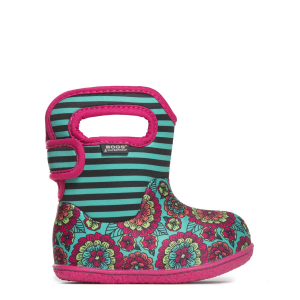 Bogs Classic Pansies rain boots' pattern may be whimsical but don't underestimate the technical side. Stay outside with 100% waterproofing, Neo-Tech insulation and a comfort rating down to -30degF. 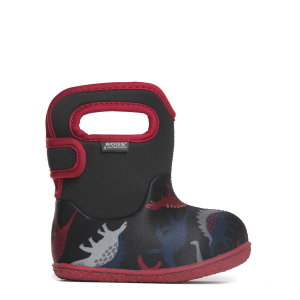 Let them spin their own fun in rain in the waterproof Bogs Creepy Crawler rain boots. Surefooted outsoles with a moisture- and odor-banishing footbed keep feet dry and fresh for long outdoor play. The Bogs Dots rain boots for girls offer up complete waterproof protection for splish-splashing, sloshing and traipsing through puddles. Constructed with lightweight, 5mm Bogs Neo-Tech Lite insulation, the kids' Durham Solid rain boots provide comfort and durability that will keep your youngster's feet dry and warm.